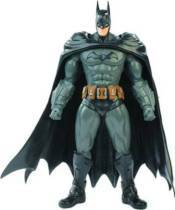 Build an articulated and detailed Batman Arkham City action figure with SpruKits! The Batman Arkham City Final Chapter SpruKits Level 3 Model Kit features realistic details and articulation to allow you to position and display your completed figure in custom action poses. Parts are already molded in separate colors with no paint required. Easily snaps together with no glue required. Easy and fun to build! Realistic details and articulation allow you to position and display your completed figure in custom action poses. More serious builders and collectors will love the awesome detail provided by Level 3 SpruKits figures. Lifelike sculpting delivers realistic facial features and unreal articulation through the assembly of more than 150 pieces that will challenge skilled builders and provide hours of fun. When fully completed, figure will stand about 8-inches tall.